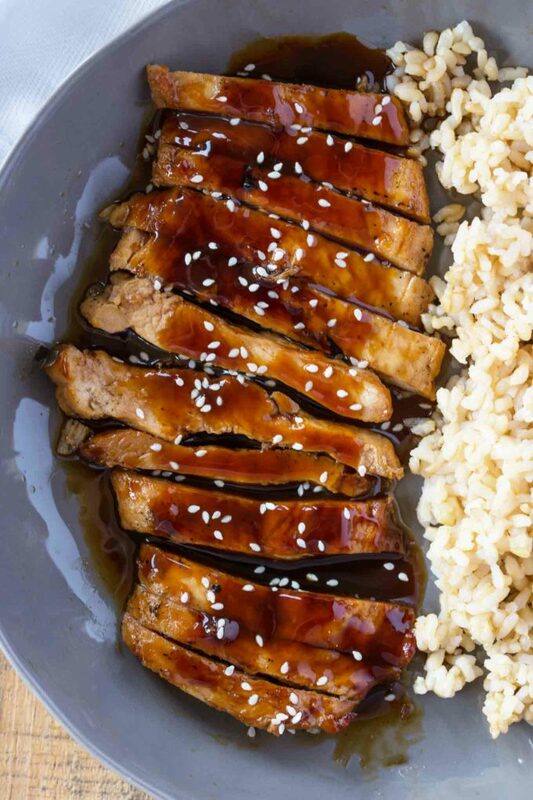 Skinny Teriyaki Chicken made with a quick and easy homemade teriyaki sauce in less than 30 minutes! 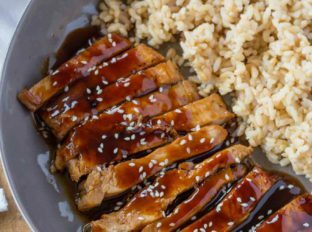 We love this Chicken Teriyaki recipe with a homemade teriyaki sauce, using the same base as the super popular Skinny Teriyaki Shrimp. Teriyaki Chicken was the number one request I’ve gotten in the emails I send out. 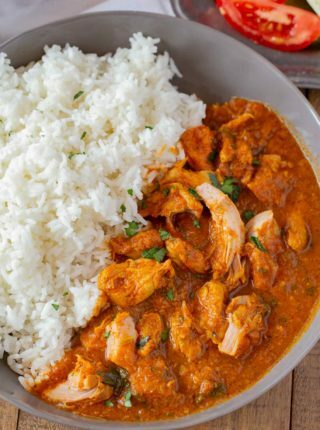 This recipe is on the blog thanks to requests from Mary H., Donald B. and Gary S. who all wanted something to replace their neighborhood takeout restaurant. 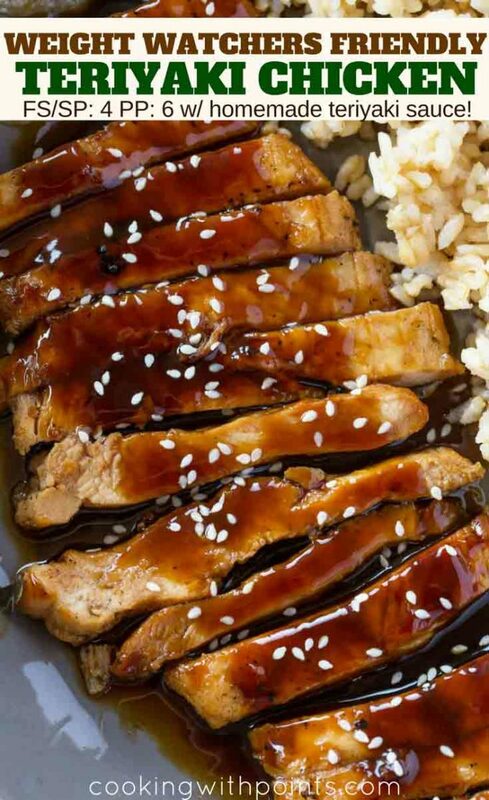 Many people love teriyaki chicken, but the sauce is so high in calories it becomes impossible for dieters to enjoy it. 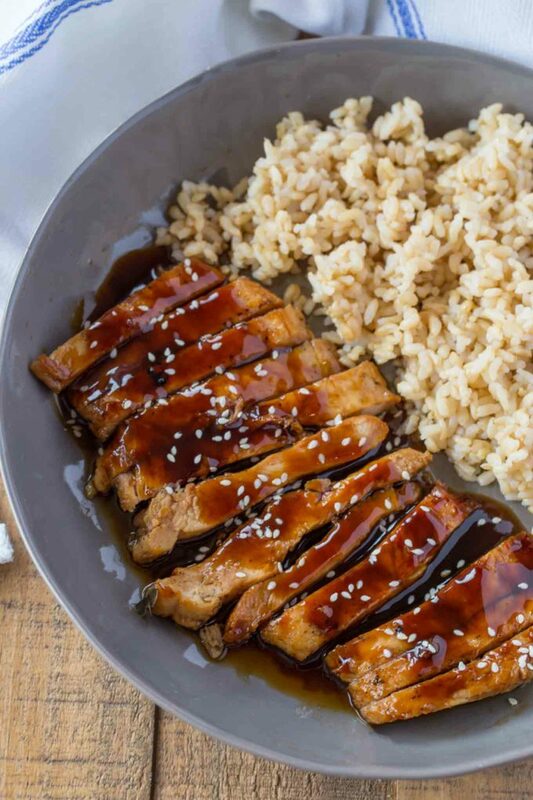 This teriyaki sauce is made from scratch but still tastes like the teriyaki sauce you know and love. 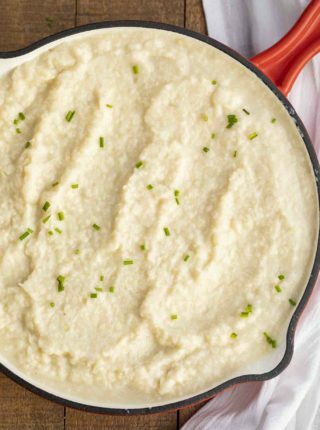 The sauce is still sweet and sticky with a punch of garlic and ginger flavor. There isn’t any time needed to marinate the chicken, a departure from most classic teriyaki chicken recipes and we get a nice “crispy” feeling by cooking the chicken pieces with a much thinner cut of chicken breast, increasing the exterior vs interior surface area. Why use the canola oil spray? We are only using one teaspoon of canola oil for the cooking of the chicken, but we want to be sure that all the chicken pieces are coated with a thin layer of canola oil. This prevents one piece of chicken from absorbing the majority of the canola oil. I tested it both ways and still got great results with this chicken being cooking using both a spray and regular canola oil. 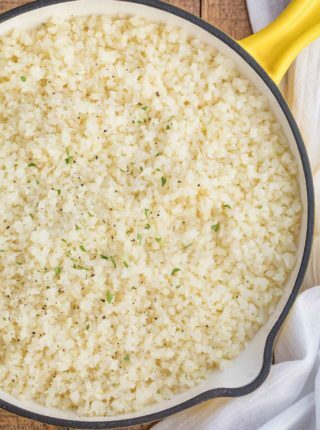 Serve it over your favorite steamed vegetables, stir fried vegetables, cauliflower or brown rice. Lettuce cups, this teriyaki chicken would be great in iceberg lettuce cups with finely shredded cabbage and carrots. Using a lean cut of beef (london broil would be great for this, cut thinly against the grain into 4 ounce steaks) sear the beef on both sides in a cast iron skillet before removing it from the skillet to continue making the sauce. I don’t slice the beef into bite sized pieces as it stays more tender to cook it in mini steaks then slice it thinly on your plate. You can also make the steak into Beef Teriyaki Skewers which are perfect for summer grilling! Add the canola oil to a large nonstick skillet on medium high heat. Spray all the chicken pieces quickly with a canola oil spray. Add the chicken and cook for 4-5 minutes on each side before removing the chicken from the skillet. Add the rest of the ingredients to the skillet and whisk well, cooking until thickened. Add the chicken back to the skillet and coat the chicken before serving and slicing into thin pieces. Garnish with sesame seeds, optional. That chicken looks so tender and tasty!! 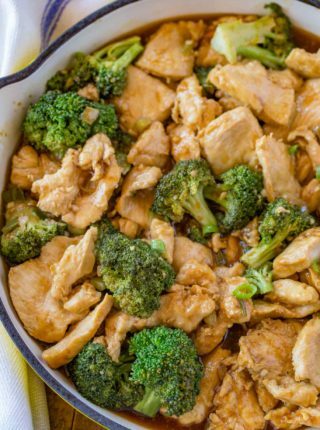 This looks amazing and so much healthier than takeout! My family is crazy about teriyaki chicken, and I love that this is a lighter version! Had my attention at skinny! I am loving this version of chicken teriyaki. I love teriyaki chicken! I have to try this recipe out! Could you tell me how many SmartPoints per serving, please? Sorry Beth, Weight Watchers would prefer I direct people to their recipe calculator instead of putting the calculation on my site. Just know my recipes are made with dieters in mind so hopefully you’ll be happy with the points values! 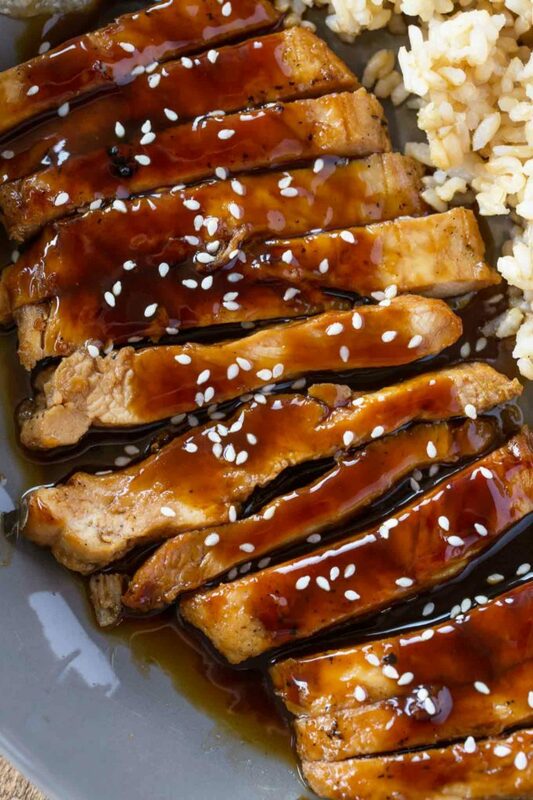 I just made this today cause I was craving teriyaki and it was absolutely delicious! Like the sauce was just absolutely perfect I made extra! Thank you!